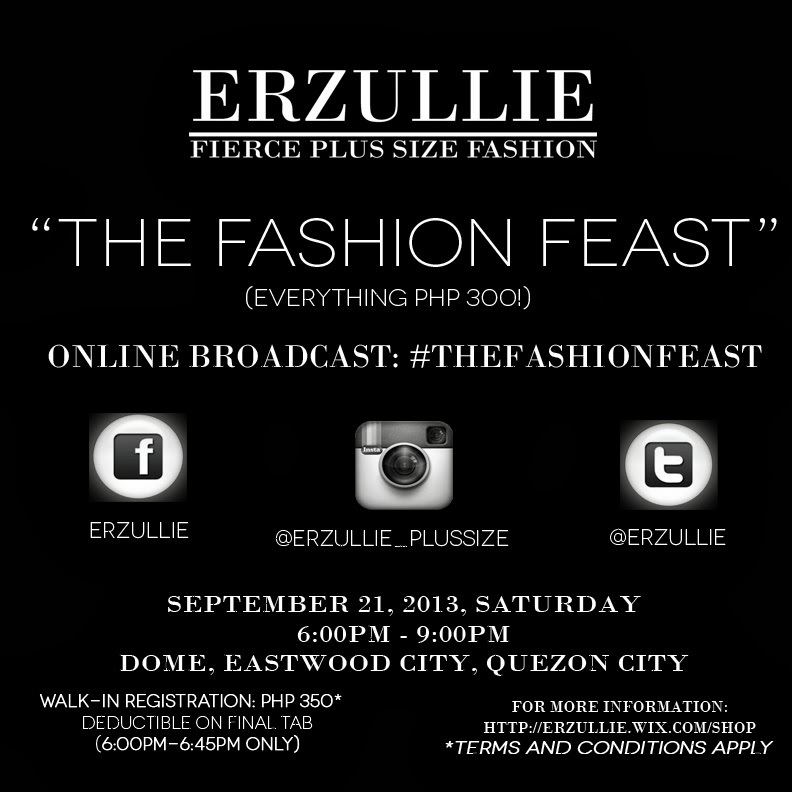 PLUS SIZE EVENT: #THEFASHIONFEAST ONLINE BROADCAST TONIGHT! We will be doing an online broadcast of Erzullie’s The Fashion Feast Sale event on our Facebook, Twitter and Instagram accounts from 6:00 pm-9:00 pm (Philippine Time). 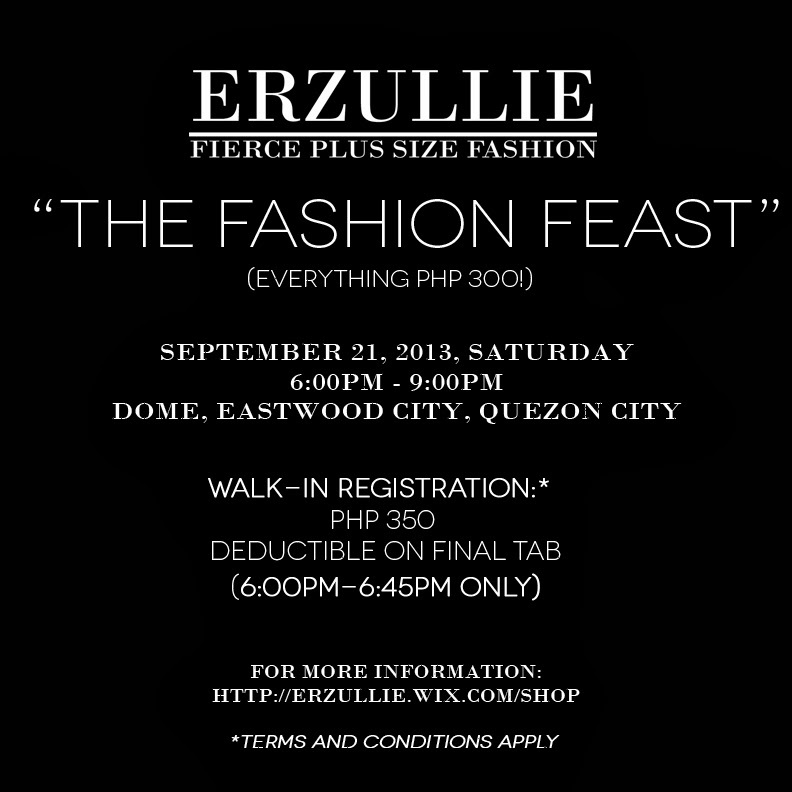 Catch all the Erzulliesta event action as it happens! We will be celebrating some fierce plus size fashion with our sisters in fashion later at Erzullie’s The Fashion Feast Sale (September 21, 2013, Saturday; 6-9pm) at DOME, Eastwood City, Quezon City. To be honest, I am excited, thankful and nervous about the upcoming event later. All of which I can explain one by one (they are all connected). I am nervous because --- we are about meet our bosses. Bosses? Yeah. Bosses. The Erzulliestas are our bosses and hopefully, they would love what Berna and I did for them. But then I am excited because I get to see them again and I love surrounding myself with fierce and empowered plus size women. 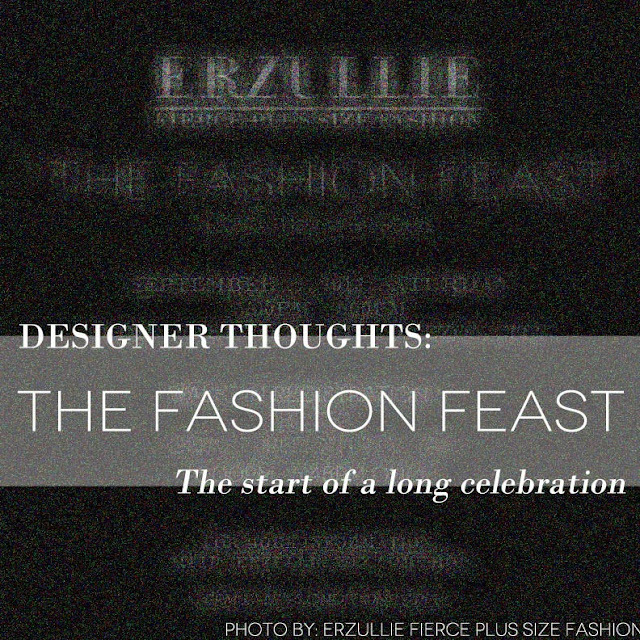 I learn a lot from them and goodness knows with the upcoming 3rd year anniversary and Holiday 2013 collection (the finale of a great year) we will need all the strength and inspiration that we can get to finish it. Which brings me to why I am thankful. 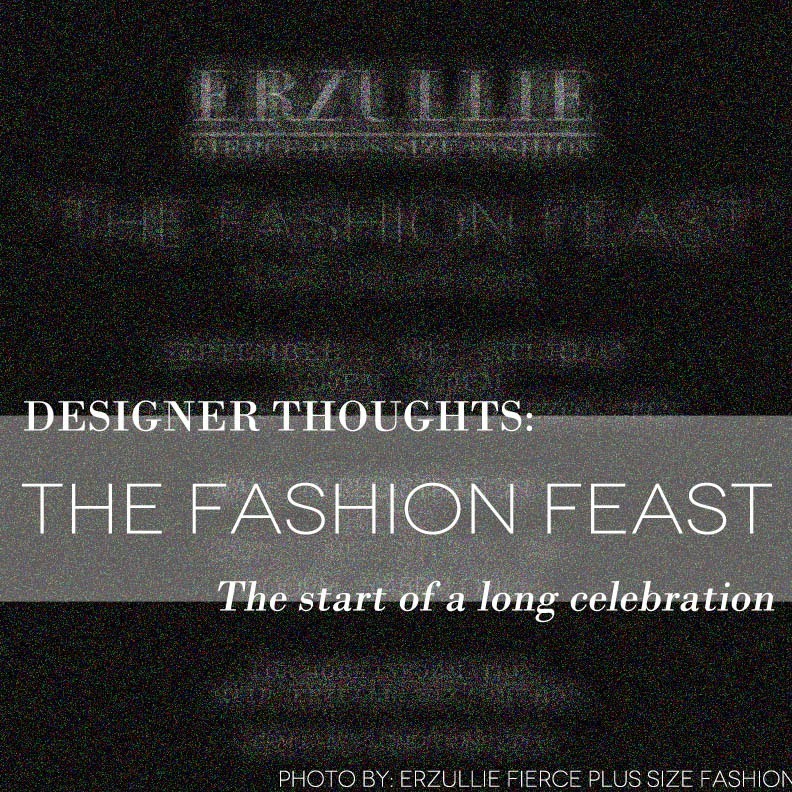 I am thankful because The Fashion Feast is actually a pre-celebration of our 3rd year anniversary as a plus size fashion brand here in the Philippines. This event is happening because of you girls (Erzulliestas) bringing us your constant business and demand for our designs. Without your fervent support of the brand and its values, we would never even exist! So I am thankful. Very thankful that we have found you girls! So, see you later, Erzulliestas! Let us again gather at DOME to celebrate, not only the brand’s upcoming anniversary but each other (our sisterhood). We (all of us in general) are now in our 3rd year and we can only see more years to look forward to together! It’s another stylish Saturday, Erzulliestas! 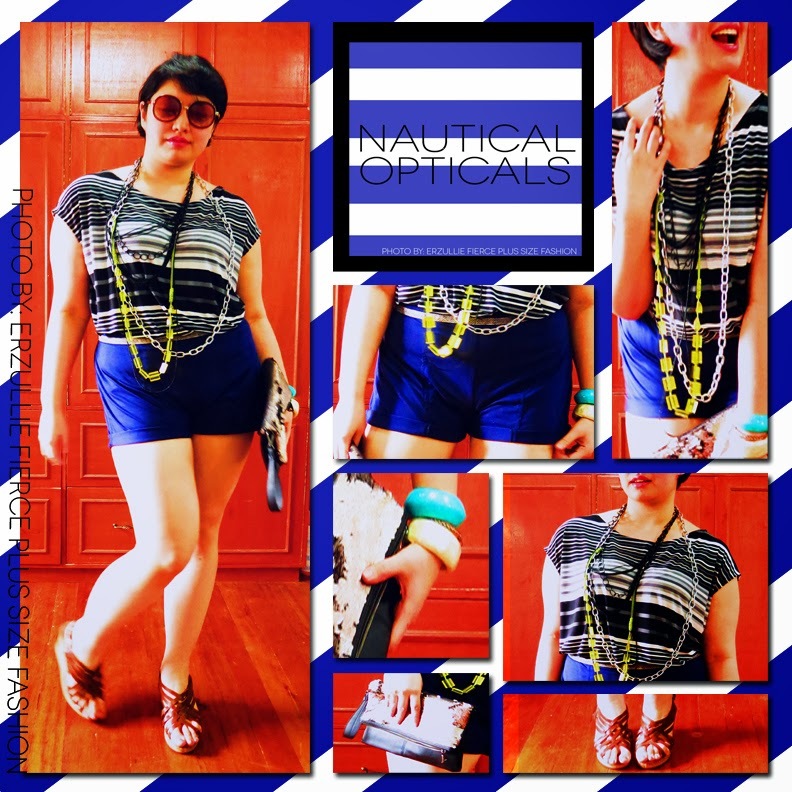 And with it, we give you another fierce plus size fashion inspiration with the title “nautical opticals”. This casual, cool and comfortable ensemble is perfect for daily wear! Want to amp it up for a party night? Switch the strap shoes for some ankle booties!